Welcome to Mercy Ebute's Blog: The Gambia's president declares state of emergency as Nigerian troop head to Gambia to sack him. The Gambia's president declares state of emergency as Nigerian troop head to Gambia to sack him. According to report on Punch, a top military source in the Nigerian Air Force revealed that Nigerian troops would be briefed by the Chief of Air Staff, Air Marshal Sadique Abubakar, in the early hours of Wednesday, before leaving for Senegal. It was gathered that apart from the NAF and the Nigerian Navy, the Nigerian Army would also contribute troops, although the number of deployment could not yet be ascertained as of the time of filing this report. The source said some of the NAF fighter jets were expected to airlift the troops. He said, “I can confirm to you that men of the Air Force will leave for Senegal today (Wednesday). They will be briefed by the Chief of Air Staff, Air Marshal Sadique Abubakar, at the Kainji base in Niger State. “That Nigeria is deploying troops is now a certainty after several meetings with The Gambian president yielded no result. The Chiefs of Defence Staff of ECOWAS countries came to Abuja on Saturday, where they discussed what components each member state is expected to contribute to the troops that will force Yahya Jammeh out. The Defence Headquarters, Abuja, however, said it could not confirm the deployments, adding that it was a matter being coordinated by political leaders. The Director, Defence Information, Brig. Gen. Rabe Abubakar, said, “We should not drag the Nigerian military into a political issue. What is happening is a political discussion between the ECOWAS leaders, aimed at solving a political impasse in one of its member states. Adama Barrow of the opposition party won the December 1, 2016, presidential election but Jammeh, who initially conceded defeat by congratulating Barrow, made a U-turn a week later, saying he would challenge the results. 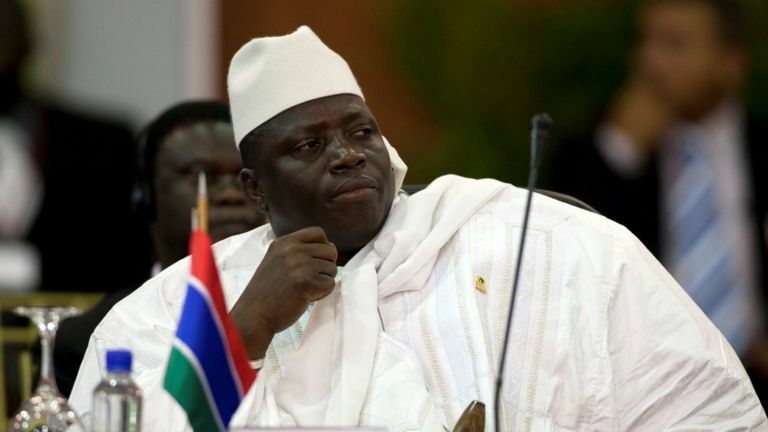 Despite interventions by the African Union and ECOWAS, Jammeh insisted he would not hand over power to Barrow. This stance informed the decision of the leaders to withdraw their recognition for Jammeh as the Gambian president after Thursday. Meanwhile, Jammeh, on Tuesday, declared a 90-day state of emergency 24 hours to the end of his tenure. The declaration of a state of emergency by the embattled President followed a rejection of his injunction to stop Barrow’s inauguration by the Gambian Chief Justice, Emmanuel Fagbenle, on Monday. Barrow is currently in Senegal and due to security fears, he was unable to attend the funeral of his eight-year-old son, who died on Monday after a dog bite.